The waters off Isla Mujeres were cloudy that November day. 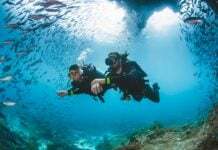 The first North wind of the season had closed the port for two days previously and when I dived MUSA the sweet reefs were still swirling with white sand. Silent Evolution was eerie in the filtered light. The faces of the statues patched with algae, their limbs blurring in the slow waft of weed and their stoic stance enhanced by marine growth. I watched a cloud of wrasse shiver in the midst of the throng and felt the weight of the sea above me. I swam away with my head crowded with images, thinking that those frozen souls watched me go and were unmoved. I followed the dive guide across the rippled sand. Another installation swam into view and I laughed into my regulator. 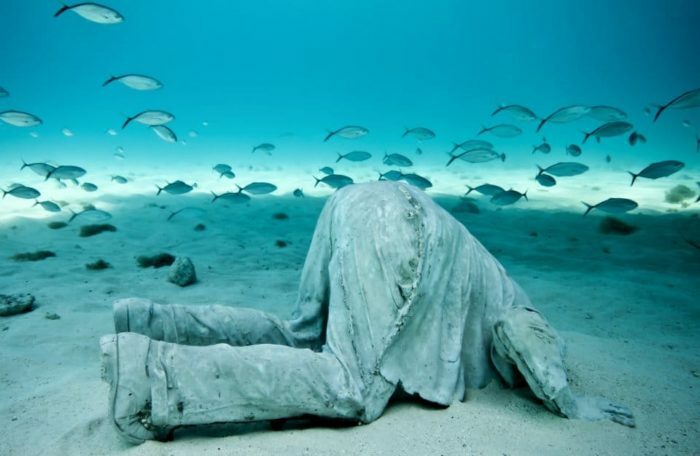 The kneeling bankers with their heads in the sand, their briefcases abandoned, their fleshy rears raised, offered up – that Jason deCaires Taylor, I thought to myself, he has a sly sense of humor as well as a poet’s heart. 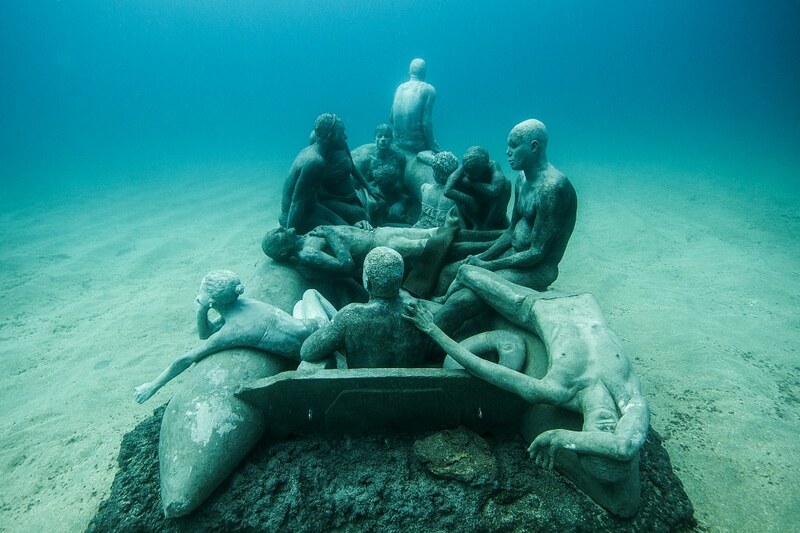 Since 2002 artist Jason deCaires Taylor has been laying his sculptures into the sea. First in Grenada where he had been working as a dive instructor and then in Mexico where he co-founded the Museo Subacuático de Arte (MUSA), an underwater gallery of sculptures, evolving in the ocean. As a diver and ecologist his works naturally have a conservationist theme but lately, in response to world events, they have become more overtly political and offer a reminder of how fragile human life is. Diving the various art installations that form MUSA was something I had wanted to do for a long time. I had admired the intention and execution of the exhibition since it was first conceived. I once owned a home on nearby Isla Mujeres and I knew how damaged the reefs were from the twin blows of hurricanes and tourism. 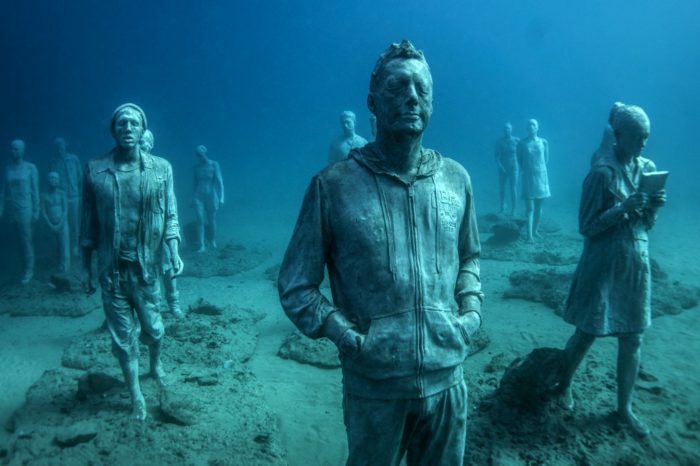 Originally intended as an artistic way to keep tourists off the recovering reefs and encourage new reef growth since 2009 over 450 life-size statues have been carefully placed on the white sand bottom off Cancun, gradually becoming home and habitat to new coral and marine species. Working with marine biologists Taylor uses pH-neutral cement for his works, a material he found thanks to the artificial reef building company Reef Ball. With the Mexican installation complete Taylor has moved his studio to Lanzarote and last winter the first 70 installations that will form his new Museo Atlantico were lowered into position. Eventually there will be over 300 pieces. His highly figurative works – often considered clichéd by the art establishment – are finding a new audience in Europe and in the waters off Lanzarote Taylor’s voice is getting louder, less whimsical, more urgent. The first installations, in a protected bay off the south coast of Lanzarote, focus particularly on current issues. The Rubicon is an ensemble of 40 figures walking across the sea floor (eventually towards a gateway). All are, in essence, sightless – either their eyes are closed or they are engrossed in their phones or cameras – as they walk towards the only exit. Taylor says this work is about climate change and how mankind seems to be heading blindly towards a point of no return. The second installation, The Raft of Lampedusa, depicts 13 passengers in a flimsy inflatable boat, sailing towards an unknown future. On the bow is an African man, his eyes closed, his hand resting on a cheap life-jacket. The title references The Raft of Medusa, a painting by Théodore Géricault of a scandalous incident from 1816 where survivors from a shipwreck off the coast of Mauritania fought for survival on a makeshift raft. Some were washed overboard, others were killed in on-board fights and some survivors engaged in cannibalism. When the raft was finally rescued after 13 days at sea, only 15 men were still alive. The Canary Islands are the first port of call for thousands of people from West Africa trying to reach Europe and Taylor says his Raft Of Lampedusa points to European governments’ unwillingness to accept responsibility for the refugee crisis. In common with his other works Taylor has cast these new sculptures from actual people. Some of the figures in the raft are of people who have actually made a journey as refugees. Abdel Kader, who was cast as the figurehead, comes from Laayoune, the largest city in Western Sahara, a profitable departure point for people smugglers. Taylor is keen to point out that The Raft of Lampedusa is not meant as a tribute or a memorial, instead it should serve as a reminder of our passivity, and our collective responsibility. 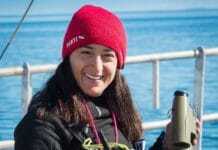 “I believe we have to address some of the crucial problems occurring in our oceans at this moment in time and by using human forms I can connect with a wider audience,” Taylor said in an interview with the Guardian at the time of launch of the new works. In the warm Caribbean waters Taylor’s sculptures rapidly became encrusted with new corals and exotic growths, changing dramatically over time. That won’t happen in the colder Atlantic waters off Lanzarote, however there will still be change and evolution as they become a new home and refuge to the local marine life. As a result of the new seas he is working in Taylor’s art has evolved too, he is focusing more on detail, in producing stronger dramatic forms, and the political narrative is growing as well. This coming December he will add more pieces to Museo Atlantico, including a giant gateway measuring 30 meters long and 4 meters high to complete the Rubicon narrative, a piece showcasing 200 people swimming in a circle, and more botanical elements including trees and a garden and hybrids of humans and plants. 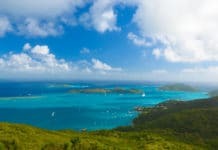 Taylor says his intention is to force us to re-examine the sea. 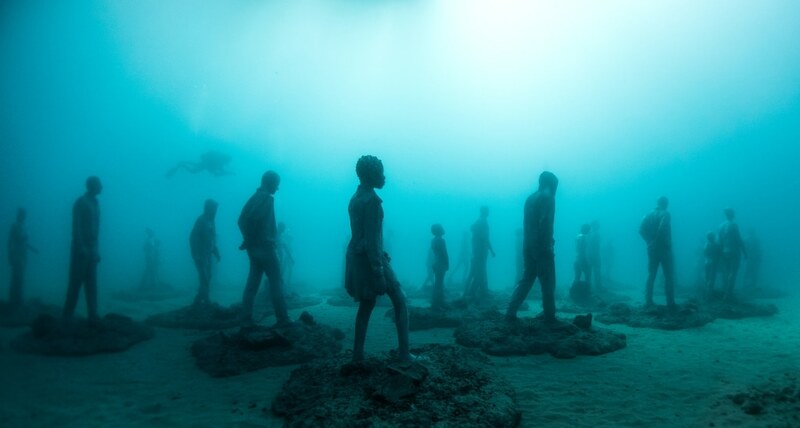 “Most of the time,” he says, “we look beyond the sea, to the horizon.” These statues force the viewer to look to the here and now and see humanity sharply in focus within the sea, which is often an unnerving experience. Maybe that is why some people react so strongly to the statues. I love them but not everybody does. I have friends who view them with disgust and fear. They find them eerie, sinister and particularly the ones which are being transformed by coral and sea life as revolting, as if their humanity were being absorbed by a creeping alien affliction. I would dive these statues every day and consider myself blessed.  We, as divers, are privileged and we must never forget that. We get to go to a world a very limited number of people have seen or will see or can see. In the whole of human history there are so very few who have been to this world and returned – we are a tiny minority. The desire to go there made us different, the desire to keep going back makes us different and the ability to be one of the limited number of people who can experience these sculptures as they were meant to be viewed is amazing. Top siders, land trapped, the vast majority, can look at the photographs and films of these works and be a little moved, but never so much as the diver who floats before the installations and sees them as they were meant to be seen, in context, powerful and poetic and sad and eerie and evolving, always evolving. Museo Atlantico opened to the public in February 2016 and its development is on-going. Part of the proceeds from ticket sales will go towards local conservation projects. You can find out more via their website or Facebook page.